Many different health professionals provide palliative care, and include but are not limited to Physicians, Specialists, General Practitioners, Nurses, Allied Health professionals, Volunteers, and others. A specialist palliative care provider has extensive knowledge, skills and expertise in the care of people living with a life threatening condition, their families and carers, including management of complex symptoms, loss, grief and bereavement. Specialist palliative care services provide care for patients with complex palliative care needs alongside the primary care team. 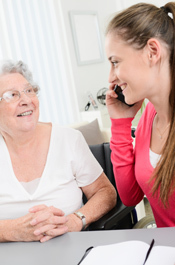 Services are provided in numerous settings including outpatient clinics, in hospital, a hospice, in the community such as in the home or residential aged care facility. Support may be via a referral, consultation and/or education. The workforce of specialist palliative care services in the Hume Region is comprised of Palliative Care Physicians, Palliative Care Clinical Nurse Consultants, Palliative Care Clinical Nurse Specialists, Social Workers, Family Support Workers, Loss and Grief Counselors, Volunteer Coordinators, and Volunteers. Should you wish to explore opportunities for working in palliative care, please contact your local palliative care service provider in the Hume Region.